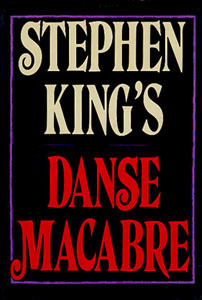 Danse Macabre (1981) is a non-fiction book by Stephen King, about horror fiction in print, radio, film and comics, and the genre's influence on United States popular culture. Danse Macabre examines the various influences on King's own writing, and important genre texts of the 19th and 20th centuries. Danse Macabre explores the history of the genre as far back as the Victorian era, but primarily focuses on the 1950s to the 1980s (roughly the era covering King's own life). King peppers his book with informal academic insight, discussing archetypes, important authors, common narrative devices, "the psychology of terror", and his key theory of "Dionysian horror."